The Center for Media Justice fights for racial and economic justice in a digital age by advancing communication rights, access, and power for all communities harmed by persistent inequality and oppression. The Center for Media Justice (CMJ) fights for racial and economic justice in a digital age by advancing communication rights, access, and power for all communities harmed by persistent inequality and oppression. Launched in 2009, CMJ envisions a future where under-represented communities have the power to create the media and communications environment they need to win justice in a changing world. The Center for Media Justice recognizes that inadequate access to communication technologies speeds up and worsens racial discrimination, expands the carceral state and surveillance structures, and further criminalizes Black, migrant, indigenous, LGBTQI, and low-income communities. Centering the power of narrative within movements for racial and economic justice, CMJ houses the Media Action Grassroots Network (MAG-Net): the largest formation of constituency-based organizations that collaborates for communication rights, access, and power. 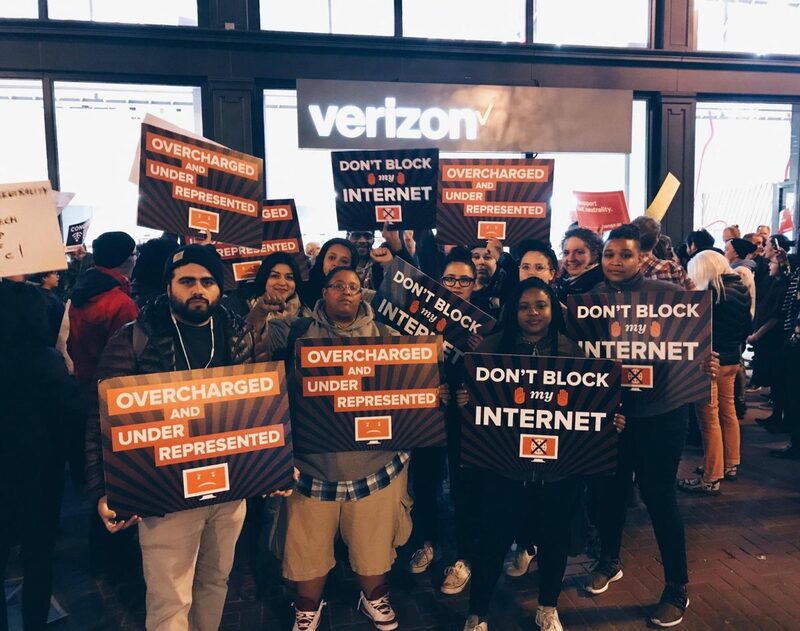 Since 2008, MAG-Net members have successfully collaborated with partners across movements to win open internet protections, reduce interstate prison phone rates, block destructive corporate media mergers, and modernize low-income Lifeline programs that connect millions of low-income households to faster broadband service. Launched in December of 2017, the Black LGBTQIA+ Migrant Project formed in response to the invisibilization of Black LGBTQIA migrants’ experiences of being undocumented, queer, and Black within migrant narratives, immigration justice, and racial justice movements. Launched in December of 2017, the Black LGBTQIA+ Migrant Project formed in response to the invisibilization of Black LGBTQIA migrants’ experiences of being undocumented, queer, and Black within migrant narratives, immigration justice, and racial justice movements. BLMP recognizes that their community lives in a space where racism, xenophobia, misogyny, trans/homophobia, policing, detention & deportation, and criminalization uniquely targets the daily life, wellness, and safety of queer and trans Black migrants. They envision a world where all Black LGBTQIA migrants and their loved ones have housing, bodily autonomy, health and the ability to travel freely with dignity and safety. 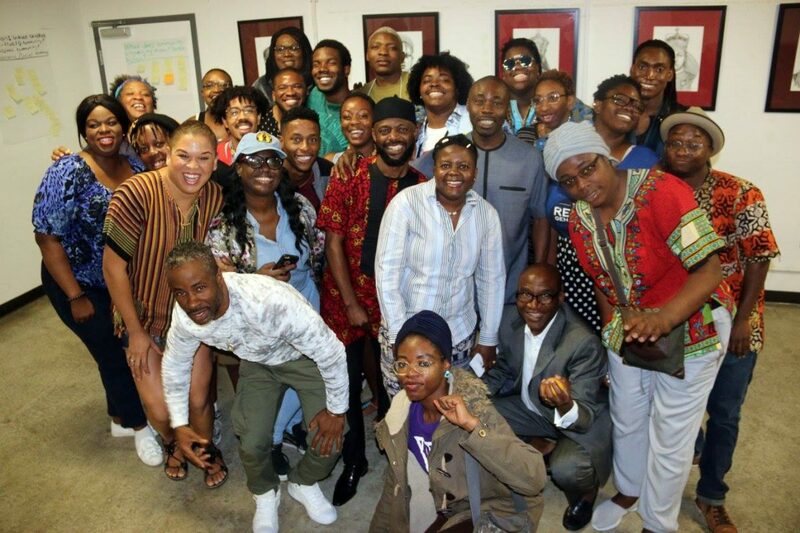 Working at the local, regional, and national level to face multifaceted & intensifying attacks on their communities, they organize community and movement building events around the country to reduce isolation, create support systems for trans and queer Black migrants, and build leadership and local power to defend Black LGBTQIA+ communities. 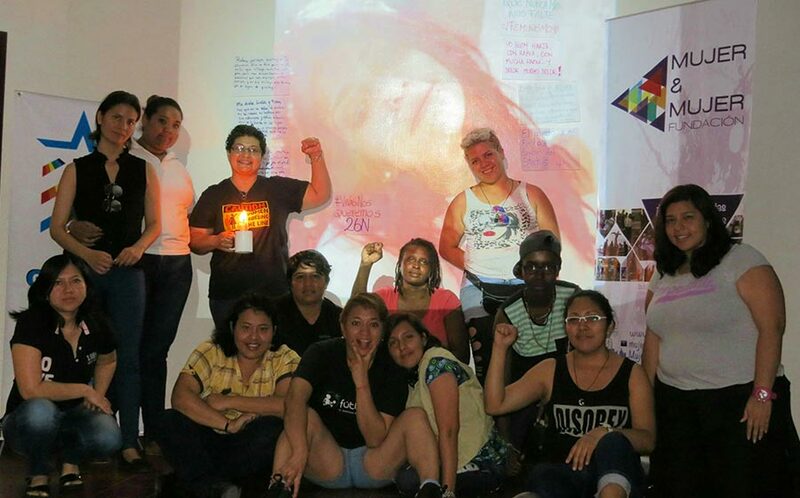 Comprised of and led by an intergenerational yet mostly youth steering committee of 13 queer, trans, women, undocumented/under-documented, and 1st generation migrants, and with three network-leads in California, D.C., and Houston, BLMP is leading trainings and community gatherings throughout the US South, West, Midwest and Northeast; in particular, with trainings focused on transformative community organizing, healing practices to address trauma, and know your rights trainings when dealing with police and ICE. SPARK envisions a future where communities in Georgia and the South have resources and power to make sustainable and liberatory decisions about their bodies, gender, sexualities, and lives. SPARK envisions a future where communities in Georgia and the South have resources and power to make sustainable and liberatory decisions about their bodies, gender, sexualities, and lives. Based in Atlanta, SPARK aims to queer the Reproductive Justice movement and uplift people of color living in the Trans experience. 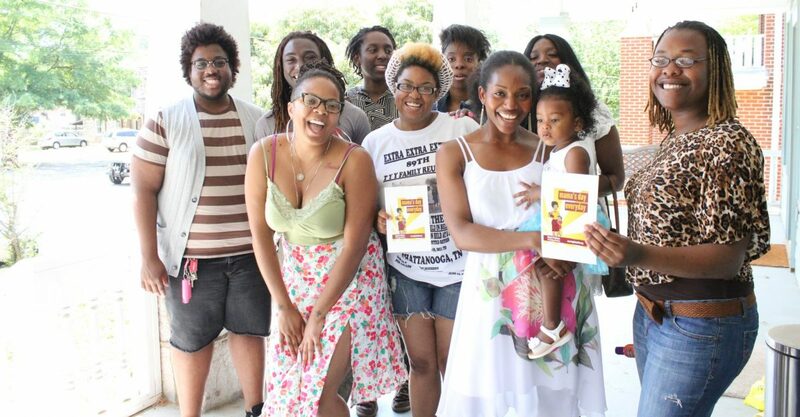 Successfully bringing a racial justice and queer liberation framework to the reproductive justice movement in Georgia and the Southeast, they believe that the Queer and Trans youth of color living in the South have a unique experience of reproductive violence, and body and gender oppression. In particular, this requires them to go beyond the traditional focus of access to abortion and contraception. Working with communities that face daily obstacles of homelessness, displacement, poverty, immigration surveillance and detention, inaccessible health care and inadequate health insurance, and stigma against people living with HIV, SPARK creatively uses collective action, policy advocacy, leadership development to create impact and empower their base. 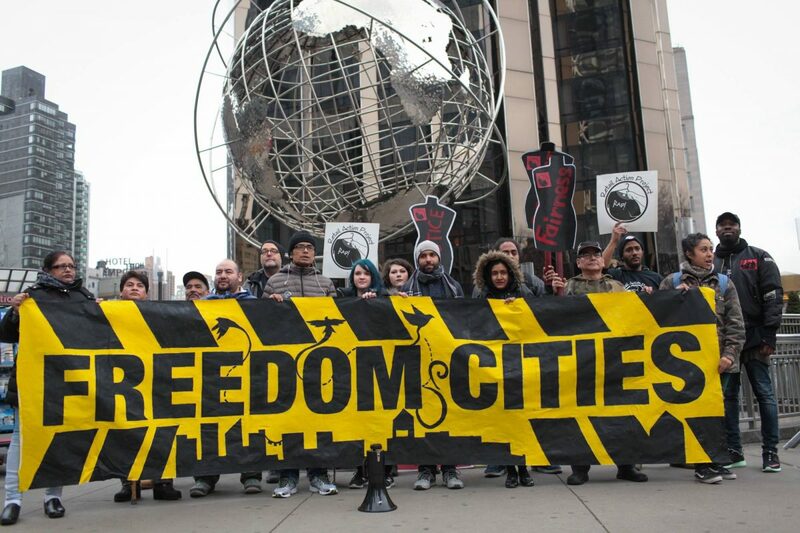 Communities United for Police Reform (CPR) launched as a campaign in 2012 after long-time New York City grassroots organizers saw the need to build a comprehensive multi-sector coalition. 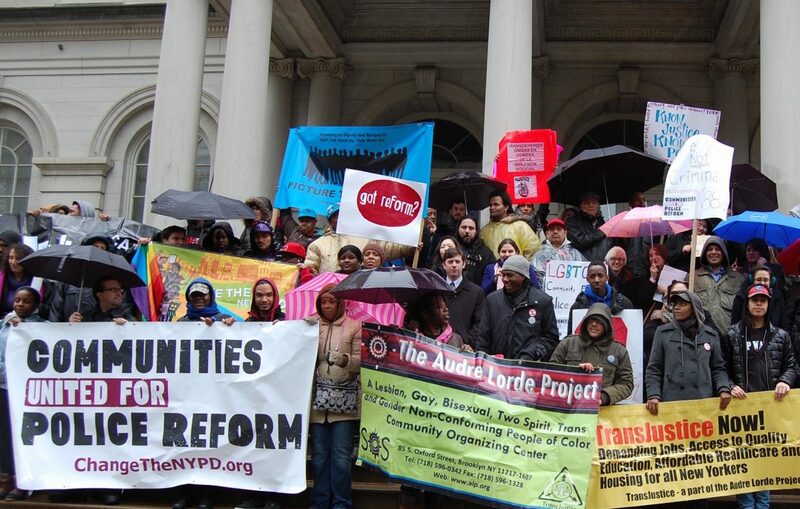 Communities United for Police Reform (CPR) launched in 2012 after long-time New York City grassroots organizers saw the need to build a comprehensive multi-sector campaign to end discriminatory and abusive policing. CPR itself is comprised of over 70 member organizations and runs coalitions of up to 200+ groups to win campaigns that strengthen community infrastructure and promote racial justice and community safety, while holding police accountable for respecting the rights and dignity of all. In spite of the decrease in reported street stops in NYC, “Broken-windows” and other abusive policing continues to target low-income communities of color, particularly immigrants, young people, homeless, public housing residents, LGBTQ and gender nonconforming people, women, and people with disabilities. Opposing the current lack of transparency and accountability within the NYPD, and the disproportionate amount of resources spent on policing, CPR envisions a transformed New York City where safety does not rely on criminalization policies or come at the expense of human rights, but instead supports community infrastructure through affordable housing, quality education and healthcare, youth services, and living wage employment opportunities. SisterReach is a Tennessee-based grassroots organization that supports the reproductive autonomy of women and teens of color, poor women and rural women, LGBT+ and gender non-conforming people, and their families through the framework of Reproductive Justice. SisterReach is a Tennessee-based grassroots organization that supports the reproductive autonomy of women and teens of color, poor women and rural women, LGBT+ and gender non-conforming people, and their families through the framework of Reproductive Justice. With leadership that centers the expertise and guidance of those most impacted, their mission is to empower their base to lead healthy lives, raise healthy families, and live in healthy and sustainable communities. They provide comprehensive reproductive and sexual health education to women and teens, and advocate on local and state levels for public policies which support the reproductive health and rights of all women and youth. 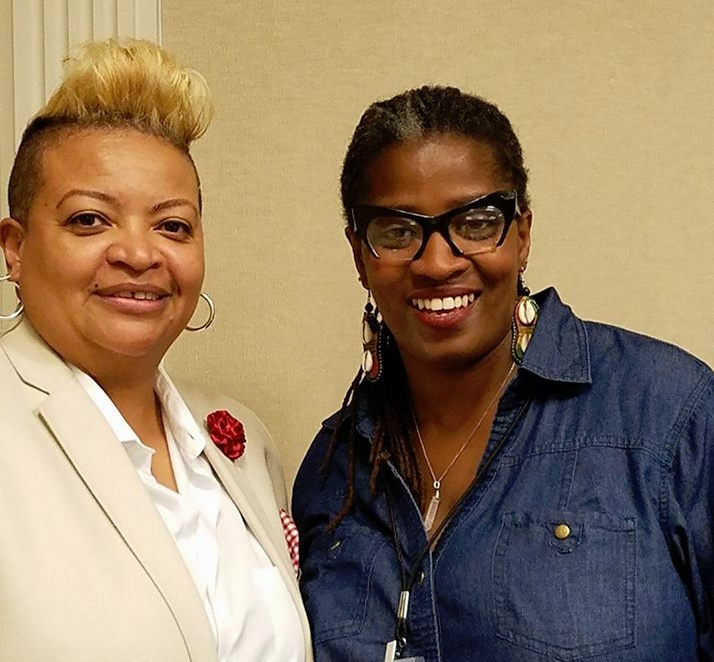 SisterReach uniquely grounds their Reproductive Justice work with a lens of womanist theology and the 8 declarations of human rights, intentionally centering youth, clergy and people of faith, and masculine of center women of color through their program, BOITALK. SisterReach has been invited to bring the BOITALK program to the 2018 LGBT Arts & Culture Festival in Punta Cana. They recently rolled out their SisterCircle initiative this Spring, working with woman-identified people within the community to hold SisterReach accountable about their needs, and working as thought partners around the work that they do. Founded in 2002, Girls for Gender Equity (GGE) was a response to a dearth of safe and equitable leadership development programming for girls of color in Brooklyn. Founded in 2002, Girls for Gender Equity (GGE) was a response to a dearth of safe and equitable leadership development programming for girls of color in Brooklyn. After incidents of sexual violence rocked the Bedford-Stuyvesant community, GGE expanded their mission to address the root causes of gender-based violence and uplift the human and civil rights of young people of color. Centering the voices and experiences of LGBQI/TGNC youth of color–girls and women of color in particular–GGE uses advocacy, organizing, and education to challenge structural forces that work to constrict their rights, expression, and freedom to live self-determined lives. With a distinct focus on safety and equity where young people live and learn, GGE’s base of cisgender girls of color trans youth, and gender non-conforming young people has pushed them to fight criminalization in schools, where sexual and gender nonconformity is stifled through law enforcement agents and harsh discipline. Blackbird believes in the power of everyday people to organize and solve their own problems given the adequate space, resources, and tools. Blackbird believes in the power of everyday people to organize and solve their own problems given the adequate space, resources, and tools. Blackbird’s mission is to work with Black organizers, organizations, and Black people interested in organizing and social justice work to build durable, sustainable movement infrastructure, and identify best practices in moments of crises. They aim to facilitate national interventions on criminalization, incarceration, state violence, and the inability of Black communities to access their fundamental human rights. Blackbird’s strategy centers collaboration throughout local, national, and international communities. Locally, they provide rapid response and capacity-building support; nationally, they work to foster strong networks between Black-led, indigenous, and people of color movements; and internationally, they connect leaders within the Movement for Black Lives to leaders of Black movements in locations outside the U.S. such as Brazil and South Africa in order to learn and strategize with each other. Freedom to Thrive (Formerly Enlace) works to create a world where safety means investment in people & planet and to end the punishment-based criminal and immigration systems. We are building a powerful Black and Brown network, centering youth, nonbinary, and femme leadership. 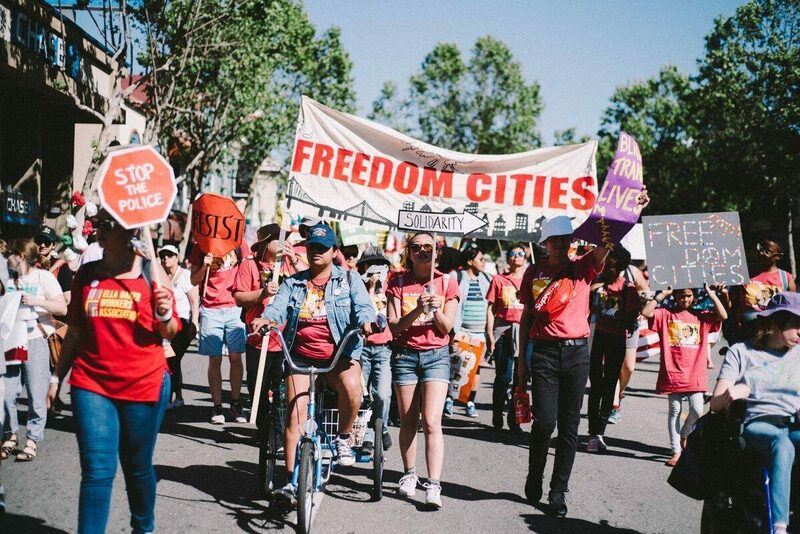 We engage our network in our Prison Industry Divestment Campaign and the Freedom Cities & Freedom Campuses Movement to address criminalization and incarceration. Our Institute builds leadership of directly impacted people to develop campaigns addressing the root causes of oppression to bring about transformation and collective liberation. Our approach to leadership development centers healing justice and political education in service of supporting empowered individuals capable of advancing a collective vision for social justice through mobilization and action. The Umoja program supports the leadership of black youth and provides on the field organizing experience with campaigns combating criminalization. Our We Rise training program supports femme and non-binary organizers of color to deepen their campaigning skills and build healing justice and wellness practices that sustain personal resiliency. Freedom to Thrive was founded in 1998 by visionary organizations in North America and Asia to support women of color led grassroots organizations to campaign against transnational corporations. After game changing victories like the International Sara Lee Campaign, which proved under-resourced grassroots groups could win demands for workers against multinational corporations, we developed strategic frameworks that became the Integrated Organizing Approach (IOA) Methodology. Our Institute launched shortly after, to train frontline leaders in the IOA frameworks in order to build intersectional campaigns that address root causes of state and corporate violence. With a base of incarcerated people, formerly incarcerated people, and their loved ones, the Ella Baker Center distinctly uses their membership program as a way for anyone anywhere – but especially those who have been harmed by the justice system – to join the movement to create a safe and just nation. Since 1996, the Ella Baker Center has fought to challenge police violence and advance a human agenda in the U.S. With a base of incarcerated people, formerly incarcerated people, and their loved ones, the Ella Baker Center distinctly uses their membership program as a way for anyone anywhere – but especially those who have been harmed by the justice system – to join the movement to create a safe and just nation. Members organize through a process of Truth and Reinvestment: telling the truth about the impact of our country’s long history of racial injustice, building the power of those who have been harmed, and engaging them as leaders to redirect the country’s criminal justice approach from punishment and prisons to the investment of resources in redemption, growth, and support for individuals and communities. The Ella Baker Center works at the local, regional, and state level in California to end mass incarceration and push for the investment in healing over punishment; increase policymaker commitment to re-allocating public criminal justice resources towards community-based prevention, treatment, and reentry services; and engage families and communities in building new models of community safety grounded in economic opportunity and alternatives to incarceration.